Spring in Montana is always an interesting time. For instance, the other day we had sunshine, wind, rain and snow. All at once. It makes it a challenge to garden here. I’ve already put out some cold-weather plants: lettuce, radishes, peas and onions. Some I’ve started inside and planted, and some are seeds that are just now starting to come up. It’s a good thing they make frost blankets. There’s nothing quite like spring in Montana. The air warms up, the earth thaws and on sunny days a sweet vanilla scent wafts around from the warm pine trees. It’s not uncommon to see me or my husband sniffing a pine tree that’s been warmed by the sun. The wind brings a scent so fresh and clean that it makes your brain sigh with happiness. The tulips are up and already fading. The rest of my flower garden is starting to come to life. The boy turkeys are chasing the girl turkeys around the pasture with their tailfeathers on display. The stellars jays are yelling at me from the tree tops. But the number one sign of spring for me: the hummingbirds are back! If February is the desperate month, March is the hopeful month in Montana. 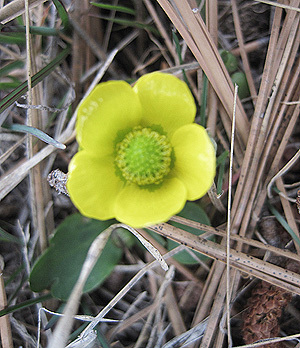 A few days ago, we saw the first buttercup emerge in the pasture. This is always our sign that spring is truly on the horizon. No matter what happens after this sighting, we know spring is on the way. True to form, the weather did a reverse thrust back into winter last night when we got 4 inches of snow. It wasn’t the light and fluffy type that melts quickly the next day. It was the wet, heavy type that you still have to shovel and plow (darn it!). This is March in Montana. Hopes are raised and quickly dashed, only to be raised again the next day. If you don’t like surprises, don’t even think about moving to Montana. Although my life probably won’t be trees this year, it’s definitely all about rocks. If you have peeked at my gardening blog (link up top on the header) you’ll know that I’m undergoing a major garden bed revision, which includes taking border rocks off, installing new, bigger border rocks and then surrounding each bed with driveway rock that isn’t being used on the driveway (a 4-foot high, 6-foot diameter pile). I’m also going to be building two new garden beds and pounding a bunch of new stakes for an expanded fence. Can you say owie? The one good thing about this type of exercise of shoveling small rocks and moving big rocks with a handtruck is that I’ve developed some baby-sized guns! I hope to turn those into respectable-sized girl guns with a few more months of garden work. I’m lucky I have a live-in chiropractor! The other sign of spring in Montana is that people burn their fields to get rid of excess dry grass before growing season and to clean up fence lines and ditches. It can be disconcerting to drive along and see a whole field on fire, but there is usually someone tending the fire with a rake and/or hose. Sometimes those fires get out of control and the fire department has to step in (we have personal experience with that!). The other thing you see is a lot of black and brown lumps appearing in the cow pastures. The cows start having babies in February and by March they are all over the place. This early in the year, they pretty much lay around unless they are feeding. In a month or two they’ll be walking around more and playing chase with each other. Buttercups, baby cows, and black fields. 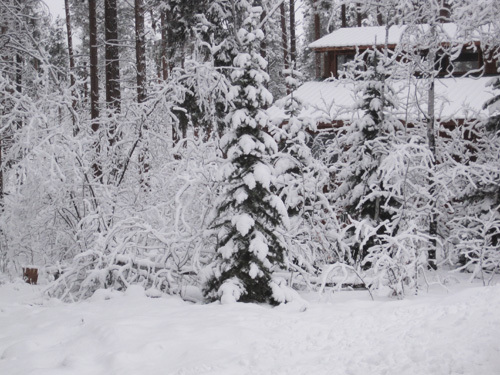 Yep, it’s definitely spring in Montana! Here’s one part of the concrete I don’t have to shovel anymore, thanks to an imbedded heat mat. It’s wonderful! We’ve had snow, then rain, then more snow lately….The Big Thaw and The Big Freeze played out over and over again. Our driveway now has several layers of ice. The other day it rained and melted much of the snow on the driveway, then it froze, creating a skating rink. I spread sand over most of the parking area to prevent any slip-and-fall scenarios, and then that night it snowed, covering up all the sand. (!) 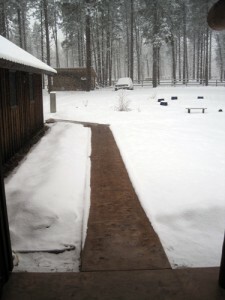 We’ve gotten about 7 inches of snow in the past two days, and today Steve plowed the driveway, uncovering….ice! My back got tired from shoveling, since most of our concrete is still uncovered. Once the remaining two porches are built that chore will go away. I bought three bags of traction sand today and I’ll be out there again tomorrow spreading sand. We put our YaxTrax to good use in this weather – they allow us to comfortably walk up the road without feeling like we’re walking on a tightrope. We were walking the other day and got about 1/2 mile up the road when we heard gunshots. There are almost no restrictions on where you can shoot here so many people do target practice in their yard. Well, when we heard the shots we turned right around and headed home. I’ve got nothing against owning a gun, but I don’t trust that my neighbors are being careful about which direction they shoot. I’m mentally preparing for February and March, when we typically have our coldest weather. Luckily, the boys installed our new dog door, taking much less time than Steve and I would have, and it has cut down considerably on the cold drafts we were feeling. At first the dogs refused to go through, but then I put them outside and it was pretty cold, so they got over themselves pretty quickly. Yes, the day after I wrote about the Big Thaw, we had the Big Freeze. A couple of inches of snow and the temps started to plummet. It’s currently about 6 degrees out as I’m writing this (nighttime temp) and it gets up to 15 or so during the day. We’re spending a lot of time indoors. The dog walks have been shortened to a run to the mailbox. The house is staying cozy with our newly insulated roof, but suddenly we are aware of small, cold drafts coming from other parts of the house, namely, the dog door. We have a homemade dog door in our back door, which we built many years ago with the help of a friend. We were convinced that a store-bought dog door wouldn’t last long with our big dog Charlie running in and out. It’s not a well-insulated opening, however, so we recently broke down and bought an Extreme Weather dog door (size large). But, it’s been too darn cold to take the old door out and put the new door in! It’s supposed to warm up later this week so maybe we’ll get a chance to put our new, magnetically sealed, insulated dog door in. Our dog door doesn’t always close properly when someone goes in or out, especially when Sammy sticks his head out for a quick visual inspection and then pulls it back in, so our new door will be appreciated. If we ever get it put in.